June 27, 2016 | -by: Kevin George. If an image is equivalent to thousand words, then a GIF is equal to million words. Email marketers have been consistently implementing the best possible ways to arouse more interest in subscribers towards their brand. In fact, the spark that cannot be created by a static image; can be created by a single GIF in your email – leading to its popularity. Why Embed GIF in Email? Animated GIFs in email not only add life to the images, but also help in drawing user’s attention, and in making your email STAND OUT from the rest. A study by Marketing Sherpa has shown that campaign results get considerably improvised by the usage of Animated GIFs in emails, besides leading to more subscriber engagement. For instance, technology giant Dell saw a 109% increase in conversions using email GIF! Static email designs can’t deliver the effective results that can be achieved by the means of animated GIF. And, that’s why GIFs have witnessed 20% of increase in open-rates than static images. There are many email campaigns that have GIFs and showcase the products in best possible manner. Well, that has even resulted into success. Brands have also been using GIF in emails as a tool to create humor. 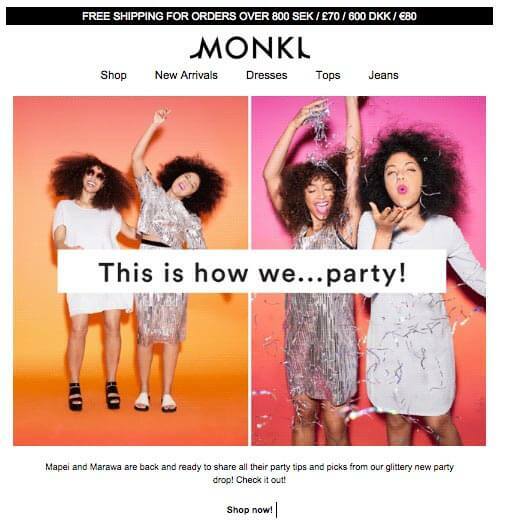 Popular brand Monki embraced GIF in their email campaigns to entice their customers for an enhanced shopping experience. How to enhance marketing Emails by GIFs? One or two aptly placed GIFs can add the spark required and can even act as CTA in emails. Focus on drawing customer’s attention by one specific animated section or color changing product line. Use is quite sparingly in order to add flavor to any sort of email. Over use of GIFs would certainly result into an ugly mess! Emails should be designed in HTML so that the size can be kept down. GIFs are used in order to portray an animated story. As we know, GIFs are supported widely on various platforms and are comparatively lightweight; that’s why they are preferred over videos and Flash. Hence, right platform must be chosen for its implementation. It becomes quite important to keep the GIFs short to the point along with proper calls to actions. It should be used precisely in order to promote specific features or product line rather than flaunting all the stuff in the email with different GIFs. Whether you are creating emails for desktop or mobile, it is crucial to test the final email before deploying it. If there are any codes that are making the email bulkier than what you expected it to be; testing would save you from negative aftermaths. GIFs in Emails have emerged as one of the powerful tools of brand storytelling techniques. This GIF email by Boden surely sets a perfect example of using GIF that serves a purpose. It portrays all the inside features of the goods displayed in the gif. Well, that’s the perfect use of GIF without any excessive animations. The image viewing settings of subscriber have the facility of turning off the image viewing, due to which, your GIF won’t be seen to the subscribers. Over here, it becomes quite crucial to include the ALT text. So, make sure that the first frame of your email itself delivers the message you are trying to convey. Hence, the desired message will be delivered irrespective of whether the image viewing is turned on or off. The GIF email designed by Loft display the first frame as “60% off” which can actually stand for itself even if there is absence of the GIF. If your GIF is well structured and designed, it will surely lead the readers to the call-to-action button. Therefore, always make sure that you deliver precise, short, and focused story that can lead to CTA clicks. This GIF email by The Dorothy Perkins delivers the specific message to the subscriber redirecting the subscriber to the “Shop Dresses” CTA button. The success of GIFs in emails depends mainly on their resolution and the number of frames. Keep the frames focused and simple, try to animate only one part of email and reduce the use of colors in it. The following email by Trello uses minimum colors and animates the only part of email that is considered necessary. Moreover, even the size of the email is kept appropriate rather than designing a long and overly attractive email. Victoria Secret opted for a puzzle themed GIF that is blended with black, white, and pink peppy colors. Despite of using least number of color combination, it had been successful in creating an out of the box GIF email experience. Brit+Co quite cleverly designed the GIF email campaign in order to introduce their new book to the subscribers. Presumably, the sole purpose behind this GIF is to give the subscribers a sneak peek into the book’s content, so that more curiosity can be generated out of them. By exercising such peppy idea, the email can surely raise the bar of lead generations. The fashion maven American Eagle Outfitters brought forward an amazing GIF email campaign in order to present their winter accessories collection. In the below GIF, the assortment of goods skillfully shifts in clockwise direction, combined with quite creative GET COZY messages that makes for a successful email campaign. The well-known brand Anthropologie, used an out-of-the-box GIF email campaign to draw the attention of the subscribers. It presented their new clothing line that is closely associated with the nature theme in the form of hidden message. The email creates a delightful mood with rain drops and letters in the form of brand name falling down, while the brand uses the “Soak Them Up” CTA to represent their clothing line the way the ground soaks up the raining water. Rather than listing out all the assortment of chocolates, Godiva brought it forward with this lovely GIF. All the flavors are presented in random manner along with their name in the bottom. Yummilicious, isn’t it? Using GIF in emails will certainly act as cherry on the cake for your ordinary marketing emails. Bear in mind, using it thoughtlessly and excessively will make it a mess of no use. Hence, go for it keeping all the above points in mind and cast a spell on subscribers by creating an everlasting GIF experience. Have you used animated GIF in email for your campaign? Well, we are always keen to hear from you. Share the GIFs in email that your customers loved the most.